Okay, here is 2014 Canada data report.. Tap and read the report. Very informative. It’s in the link on the previous reply. Edit: okay here’s the direct link. The 2014 data cited indicates about 33% of filers paid no income tax, and that the top 8.4% paid over a third of the total income tax, and so on. It would be helpful to see what the corresponding numbers were back in the 1970s, to see if the general popular impression that the better-off are paying proportionately less of the total income taxes collected is accurate or not. In any event, I've been reading comments on here for a few years now and seems to me pretty much everybody says they seek to send as little income tax as possible to the "tax man". Some, even those who say they are comfortable, have even said they regularly do "tax planning" to minimize taxes and maximize deductions or credits, so I'd say the 40 or whatever % that pay no income taxes are just those Canadians who've managed to achieve what the rest of the Canadians generally aspire to, i.e. to contribute as little as possible to the general Treasury while receiving the maximum entitlements available. Even if it were 40% of Canadians that didn't pay any income taxes in 2014, it is not significant. I don't expect the 29% under-25 population to be paying much in income taxes, especially the 0 to 9 year olds! That leaves only 40% - 29% = 11% of the population in the age 25+ population who would not be paying any income taxes. But is it 40% of the population or 40% of tax returns? According to the 2014 data, 33% of tax returns paid no taxes. I would use 100% - 29% = 71% and 71% - 40% = 31% as a number perhaps representing the actual income tax paying population. But it’s really dependent on what constitutes that 40%. And if those upper echelon incomes are paying 72% of all income taxes, then perhaps the income tax paying population isn’t as large as maybe perceived. This article mentions overall taxation as well as income tax. Apparently it’s also the situation with USA income taxes. I don’t think that original article, posted in this thread, included children as not paying income tax. The original article needed more clarification and definitely different examples of net zero income tax situations. I call BS on that title of 40% of Canadians paying zero net income taxes. It’s completely misleading. It’s 40% of income earners or 40% of tax returns. Some may not even file a tax return, but I accept the 40% as meaning income earners in general. Edit: it probably doesn’t just include workers either, It could easily be an old lady with a meager cpp, oas, gis. The great majority of Canadians pay much less than the average effective income tax rate. Indeed, one in three (30.6 per cent) of all tax filers pay no income tax at all, since their credits and deductions exceed their income. Almost half of all tax filers (44.0 per cent) pay an effective rate of less than 5.0 per cent. A decade ago, the Canadian Centre for Policy Alternatives released a report, Canada’s Quiet Bargain, which argued that the vast majority of Canadians gain much more from public programs than they pay for in taxes. Certainly the tax data continue to bear this out. - ... one in three (30.6 per cent) of all tax filers pay no income tax at all, since their credits and deductions exceed their income. - ... argued that the vast majority of Canadians gain much more from public programs than they pay for in taxes. Which means those same Canadians contribute absolutely nothing to the maintenance or growth of Canada - they're just taking up oxygen. Not quite. They are consuming the very products and using services that make the rich richer and they are raising the future consumers that will continue buying the products that pay the rich their incomes in the first place. If we dumped the entire “income tax free” population, would the upper income lifestyle’s be preserved? Eliminating the excessive assets and holdings of course. If the rich only had their home and personal belongings, would things continue on as they are now, without the “income tax free” households existing? It's obviously true that we're not paying our way, that we take out more than we put in, as governments at every level have been racking up debt for decades now to make up the difference. Aside from many filers not ending up paying any net taxes, there are as well a lot of people working in the underground economy for cash who don't file. Easy to do, CRA expends virtually no effort to find non-filers (that's hard work), they focus on mistakes made on filed returns as that's way easier to do. It's hard to generalize about who's not pulling their weight. For example, I know a guy who moved his residency and businesses' headquarters to a tax haven last year (he'd had enough) but he's still employing and will continue to employ about 40 Canadians here in Canada. They make a good living and pay income taxes here, so this guy, even though he's paying little or no income tax here himself, is still contributing to the Canadian money pot. Vatox, you speak of "the rich". Hard to know what that means, what's your working definition of when that line into "rich" is crossed? “The rich” is a different value for everyone. It’s a relative description. Apparently the government doesn’t consider 75k total household income and 3 kids, to be rich, because they probably don’t pay income tax. And I agree with that. I would probably mark a one person income of 100k or higher as rich. It’s interesting how different people have expectations of lifestyle though. Your question is a loaded one as it’s completely relative to the perceptions of entitlement. Now come all the different views and perceptions of quality of life and the money required to do it.. 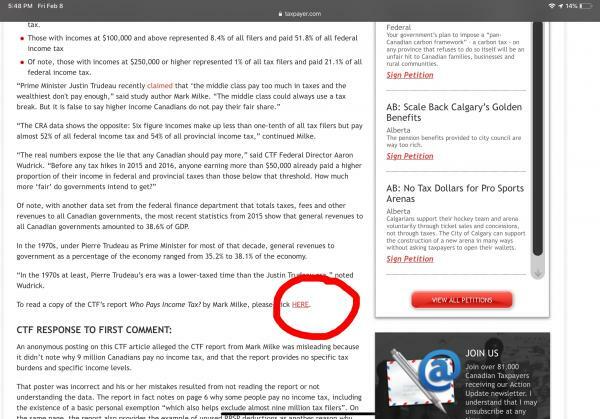 The 40% in the National Post article refers to Canadian households, not persons and not income earners. Yes, a household of one elderly widow with a meager CPP, OAS, and GIS counts as one such household in the 40%. It is quite plausible that 40% of the Canadian households don't play any net income taxes. It is even plausible that 40% of Canadian individuals don't either. That less-than-5% paid could be more than offset by Canada Child Benefit and GST/HST rebates. And I’m calling BS on that article title. That’s exactly my point. It’s not 40% of Canadians. It’s 40% of Canadian tax returns or 40% of Canadian income earners. I also call BS on the American article title for the same reason. It’s not 44% of Americans that won’t pay income tax, it’s 44% of American income earners or American tax returns. Vatox, be careful of looking just at income re who's rich. For example, I know a very elderly lady who lives in a house worth about $1.2 million and who has an annual income, including about $18K of gov't pensions, of maybe $30K. Her medical and personal care expenses are substantial. As she will probably only live another 2 years or so, she won't spend much of her total wealth. To you, is she "rich"? For me the definition is a bit more complex when the majority of wealth is held in real estate, mostly 'cause ya' gotta' live somewhere ... but I do believe individuals holding a million in unencumbered cash, are most certainly well off. I say not rich. I look at income sources and that old lady isn’t pulling 100k income. I would say that, health issues aside, a paid off home, no debts and 30k income, she is solid. I agree, that million in cash is generating income on top of a job or pension.